It’s so easy to overdo it this time of year. Your co-workers are taking turns tempting you with sweet treats at the office. Then, when you get home, there’s an endless assortment of cookies, pies and baked goods available, thanks to well-meaning neighbors, family and friends. Just add in a couple of rich meals with the family plus those annual parties and the healthy routine you worked so hard at building is out the window. Let’s face it: we celebrate the holidays with lots of food. But you don’t have to be a scrooge, deprive yourself and avoid everyone. It is possible to have fun, enjoy some of your holiday favorites and stay healthy, too. No guilt. Feeling guilty after indulging in food can lead to a spiral effect of unhealthy behaviors. Give yourself permission to enjoy. There will be some great memories made that you’ll want to be part of, especially if it’s your child’s first time baking cookies or Auntie M is bringing her famous sweet potato pie. P.S. 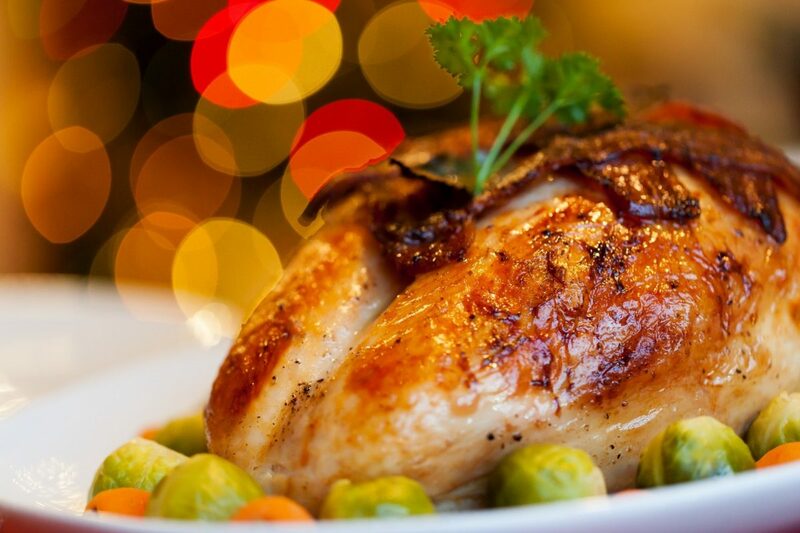 Did you know that the average person only gains about one pound during the holiday season? But no excuses either. Vacation days and the spontaneity of the season shift our normal schedules around. However, this is not the time to forget every good habit and start eating pie for breakfast, lunch and dinner. Remember that Thanksgiving is one day; it’s not a continuous feast that starts the week before and lasts until January 2. Pick your moments to splurge and try to stay as close to your routine as possible. Eat your veggies. Aim to make veggies half of your plate at mealtime. They tend to be high in fiber, as well as much-needed vitamins, so you’ll reap multiple benefits. P.S. If you’re asked to bring a dish, why not offer to bring some veggies so you’ll know there will be some. But don’t be fooled. During the holidays, even the veggie dishes become more indulgent. Beware of concoctions masquerading as “healthy.” (Lookin’ at you, creamed spinach, yams smothered with marshmallows, and green beans swimming in a casserole.) Keep an eye on portion size if these are your favorites. Don’t try to “save” calories. It can be tempting to forego breakfast and lunch on the day of a big event. However, the strategy of skipping meals in order to save your calories usually backfires. You arrive at the party famished. Overwhelmed with choices, you’ll end up scarfing down everything in sight. Snack healthy. Keeping your blood sugar in check during the day will help you keep your appetite at bay. When you feel like nibbling, take advantage of yummy seasonal fruits at their peak now. Choose from apples, pomegranates, oranges and grapefruits. Pair them with a handful of nuts, which are packed with fiber and healthy fat. Slow down and savor. Enjoy every bite you take and the company around you. Put your fork down and talk in between bites. Give your body time to trigger your brain that you’re satisfied – before you’re stuffed. Eat calories instead of drinking them. With so many decadent food choices, beware of piling on with alcoholic and non-alcoholic beverages that are laden with sugar, carbs and calories. Water can help you stay hydrated and cut cravings instead. Try alternating a glass of water for every alcoholic or sugary drink you have. Or, mix club soda with wine to slow alcohol consumption and cut calorie intake. Eat “low to high” and enjoy dessert! Yes, you can have your cake and eat it, too! Try eating low to high to build up to the richest food. Start with the lowest calorie food options, like broth or salad. Then move to the lean protein as you work your way up to the triple-digit dessert items. You’ll feel nourished and not deprived. Take a walk. Something as simple as a brisk 15- to 20-minute walk after a meal can help ease digestion and stabilize your blood sugar. From all of us at YourTown Health, eat well and be merry this holiday season!